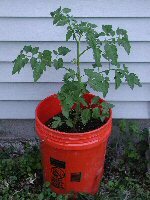 A test of the Topsy-Turvy tomato planter vs. normal container grown tomatoes. 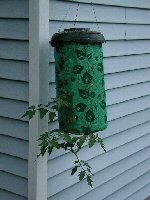 We decided to perform our own test of the "Topsy Turvy" tomato planter. We planted two identical "Supersonic" tomato plants on May 27th. For the experiment, we chose to use Miracle Grow potting soil. We placed identical amounts in the hanging container and a standard 5 gallon bucket with drainage holes added. Both containers are located so that they get the same amount of sun and to the extent we can control it, water. Both were planted at the same depth. So far, as you can see from the photos, both are performing about the same. Each has blossoms and has grown about the same size. Our simple, and again, not scientific experiment gave us roughly equal yields from the two tomato plants grown. When it came time to clean up the garden, the root systems from the two containers were roughly identical. The Topsy Turvy planter held up well and looks like it will give many years of service. It would work for those that would like to add a "vertical" dimension to their gardening. The only drawback the we see with this product is that it is quite heavy when watered and it requires a substantial support system. Topsy Turvy is a registered trademark of Felknor Ventures LLC.